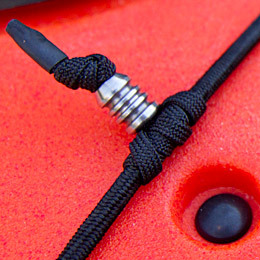 The prusik is a common friction-hitch knot. It’s amazingly simple and has the very cool property of being loose when unloaded, and tightening like a noose when under load. This would be great for sliding it where I wanted it along a piece of shock cord, but then tightening into place when I pulled on it. All I needed was some gutted 550 paracord (meaning the inner white strands were removed) and some heat shrink tubing for finishing. I did this on one of my kayaks and it worked great! However, I realized that it could use a little sprucing up if I was going to do this with my more aggro ocean play/day boat. But all the myriad corks and beads I could find didn’t really speak to me aesthetically. So, I found lathed titanium beads and, even better, stainless steel skulls! The former would never rust, and the latter should be good for some time with some rinsing with fresh water, which I do after I paddle anyway. Perfect! A little heat shrink tubing on the ends keeps the ends tidy and prevents unraveling. So: Functional man-jewelry for my kayak’s deck rigging. This should be done on deck-top rigging only: Never put anything like this on the actual rope perimeter lines of your boat. Anything that can prevent a swimmer – especially if that swimmer is you – from grabbing your boat by its perimeter lines is Major Bad Juju. What a great way to attach things to the deck lines. I may not use it to attach a scull but I do have numerous needs to fix things on deck lines. GPS, video cameras, map cases. As an aging rock climber I should have thought of a prusik knot! Thanks for the tip.